There’s a question you’ve probably asked yourself during ownership of a car … where do you take it for servicing or maintenance? You’ve got two options, the main dealership or a local independent garage?! According to a recent survey, over 60% of motorists would prefer to visit an independent garage. Why is this? Surely the main dealership is the best? Won’t an independent garage throw on cheap parts? To start, will a local independent garage throw on cheap parts? This is where you come in. If you would like genuine parts fitting to your vehicle, you will need to make this clear to the independent garage. Traditionally independent garages will use aftermarket car parts / non OEM parts as this brings the cost down significantly. But if you ask, they likely will be able to get those genuine parts you require, just expect to see this in your bill! Buy cheap buy twice, right?! Won’t these OE replacements be poor quality? Not necessarily. Although replacing your parts with ones that the car would have rolled out the showroom with is theoretically correct, the standard of modern-day replacement parts is far better than it was 15 years ago. It’s attractive to have Full Dealer Service History when it comes to resale of the vehicle, however nobody really turns their nose up at full service history from a local garage, however, you will pay more for parts, and more for labour. Main dealerships may also be able to offer you a courtesy car to keep you on the move whilst your car is in with them, this is something less likely to happen from a local independent garage. 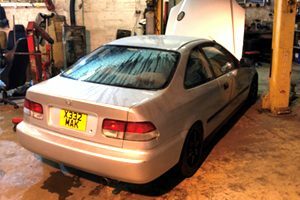 Traditionally independent garages have lower labour rates, and quite often go the extra mile to ensure you are happy as their reputation is themselves, with no big corporations to protect their mechanics. Whichever choice gives you the greater peace of mind, be it the hard working, friendly local mechanic or the well-established corporate dealerships!